A proud preferred provider of Invisalign, Dr. Ralph Corpuz, Dr. Sara Kluver, and Dr. Carmela Asinas has improved many Omaha patients’ smiles with this invisible alternative to traditional metal braces. Instead of a network of wires and brackets, the Invisalign system uses a series of soft, comfortable aligners to gently realign crooked teeth. Invisalign enables patients to have the straight, healthy-looking teeth they want without the discomfort, dietary restrictions, and embarrassment of old-fashioned metal braces. Dr. Ralph Corpuz, Dr. Sara Kluver, and Dr. Carmela Asinas will use digital imaging to create a 3D image of your teeth, determine how long your treatment will take, and create a mold from which to custom-craft a set of clear aligners to slip over your teeth and begin the straightening process. The aligners can be removed for eating, drinking, flossing, and brushing. Every two or three weeks, a new set of aligners will be produced to gently continue the straightening process. Patients will use from six to 30 sets of aligners, depending on the degree of correction required. Dr. Ralph Corpuz, Dr. Sara Kluver, and Dr. Carmela Asinas will evaluate your smile and map out your individualized treatment plan during a consultation. Giving you the best smile is our priority. Invisalign can be for adults, even teens! Dr. Ralph Corpuz, Dr. Sara Kluver, and Dr. Carmela Asinas have helped numerous patients’ in the greater Omaha area achieve a healthier and beautiful smile when it comes to treating crooked teeth, one of the ideal options is Invisalign, a clear alternative to traditional orthodontics and metal braces. Invisalign is a state-of-the-art orthodontic treatment system that’s a popular alternative to traditional braces that use brackets and wires. Instead, Invisalign uses clear plastic trays that are custom molded to your teeth. A new custom tray is provided every two weeks, and it is slightly different than the previous tray. This change in trays every two weeks allows for a gradual re-alignment of your teeth over time. Patients will wear their Invisalign aligners for about as long as they would traditional braces. There are plenty of great benefits to have Invisalign for anyone. Rather than having a mouthful of metal brackets and wires, Invisalign® trays remain hidden and virtually unnoticeable. Even when people are up close, they may not suspect that your tray is in place. This means advanced orthodontic care without the aesthetic drawbacks of orthodontics. 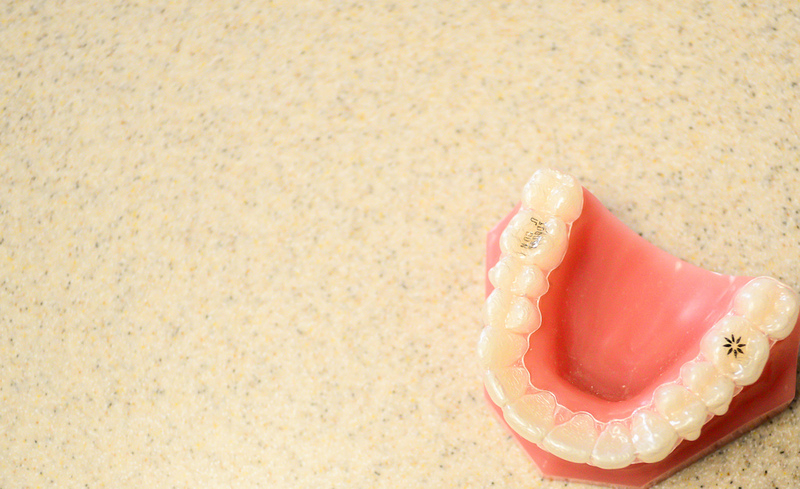 Invisalign® aligners pop right out just like a retainer. This means that patients don’t need to use special floss threaders or toothbrushes to clean their teeth. It’s just the normal routine like they’re used to without hassles. In addition to being easy to remove for cleaning, the easy removal of Invisalign® aligners also means that patients are able to eat their favorite foods and drink their favorite beverages. Just remove the aligners and enjoy popcorn, taffy, and soft drinks. Patients are just asked to clean their teeth before placing the aligners back in. An Invisalign® aligner can’t double as a mouth guard for sports, but it can be easily switched out if patient is an athlete. And when there are special occasions , the Invisalign® aligners can be popped out so you look totally fine. One reason why anyone may feel resistant to getting braces is the level of self-consciousness that they’d face with the braces in place. Since Invisalign® is virtually undetectable, even when up close, patients will not feel self-conscious about having braces or suffer any bullying or teasing as a result. Invisalign is great for many teens as well as adults, but it can’t address all orthodontic care matters. In order to find out if Invisalign is the right treatment option for you, it is important that you meet with Dr. Ralph Corpuz and Dr. Sara Kluver in person to undergo an examination and get all of the info you need to make a wise decision about your dental health.